The CZone™ Display Interface (DI) is the interface between the CZone™ network and the user. 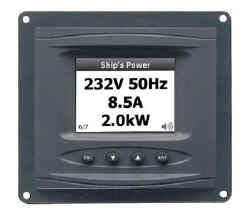 It offers full control of circuits as well as the ability to view important on board systems information such as tank levels and power levels (for both AC and DC supplies), it also provides audible and visual alarms with systems diagnostics. The DI is extremely intuitive to use with simple controls and a menu structure that is easy to follow.The “modes of operation” feature allows the control of multiple circuits with a single push of a button. For instance, “night running” mode turns pre-selected lights on to dim levels. These modes are all user configurable. The DI can be used to set CZone™ parameters for initial installation and future system maintenance.